We are located in Bastrop, LA. 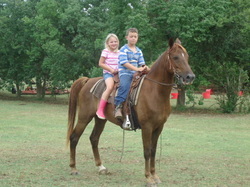 We specialize in buying and selling gentle riding horses for all ages and types of riders. Gentleness and safety is our main concern, not color or pedigree. We like everyone to go home happy and feel safe and comfortable with their new purchase. All prices listed are negotiable. It never hurts to ask. We occasionally take trades so if you have something to trade, just let us know and We'll see what we can do. Package deals are also available if you see more than one that you can't live without. Feel free to ask any questions as they're always welcome. Delivery is available if needed for a fee. Please feel free to call or email about the horses. Email is usually the fastest way to get in touch with me. Im not always available to answer the phone. If I don't answer, just leave me a message and I will get back with you as soon as possible. Thanks!